And the winner is....Darlene B (random.org)! Congratulations, your book will be coming to you! Wow...just the verse I needed to hear today! At times it is good to be reminded that we may not always get the acknowledgement or recognition we feel we deserve here on earth. Recently, I was filling out an evaluation for my job at a library, when I started thinking about my job as a parent. I commented to a co-worker, that I haven't had to fill out an evaluation or be reviewed by a "boss" in over 10 years. I don't have an official yearly meeting with my husband or children to let me know how I am doing, what my strengths and weaknesses are as a mother. Yes there are times, in the heat of a moment, that my family may let me know how I am doing, but not always in a constructive way. There are those moments, where your child or spouse may tell you they appreciate you, that they are thankful for what you do. But more often, a parents job can seem mundane, often thankless, in the every day mess we call life. 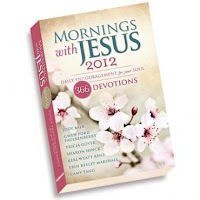 Enter today's devotion reading from "Mornings with Jesus 2012". I love this new devotional! Each day starts out with a verse from the Bible, followed by a short story, and ending with a Faith Step, or a challenge/put in to action step. Today's reading had a great reminder, "I don't get a certificate or another trinket as I serve Jesus. An eternal inheritance is my reward. He is the one who will shine bright in our lives now, and for eternity. I need to remember that He is the one I work for, and pleasing Him is enough". Even if you only have a few minutes in the mornings, this is a great way to start your day! I give this book 5 stars, and have even been blessed with an extra copy to give away to one of my readers! Make sure to comment on this post, and you will be entered in the giveaway! I was given this book in exchange for my honest review from the Litfuse Publicity Group. I would love to win this also! I would win love to win this also.